Hodge Albert Newell was born on August 22, 1883, in Franklin County, North Carolina, to Rev. George W. and Sarah Coppedge Newell. By 1900, the Newell family was living in Louisburg, North Carolina. Hodge Newell attended college as an undergraduate studying medicine at Wake Forest College in Wake Forest, North Carolina; he was a member of the Medical Class at Wake Forest in 1903. Newell graduated with a medical degree from the College of Physicians and Surgeons in Baltimore, Maryland, in 1906. He began practicing medicine in Louisburg, North Carolina, after graduating with his medical degree. On June 2, 1909, Hodge Newell married Janet E. Hayes, but she died the following year. In 1915, he married his first wife’s sister—Mary Hayes. 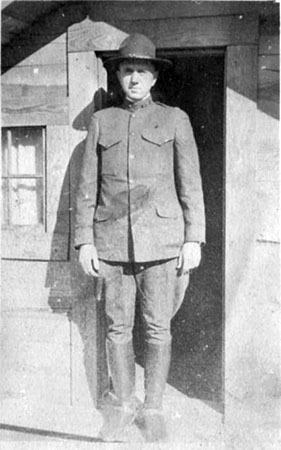 Hodge Newell was commissioned by North Carolina Governor William W. Kitchin on April 21, 1910, as a First Lieutenant in the North Carolina Army National Guard’s Medical Corps. He was inducted into federal military service in 1916, when the United States sent various National Guard units to New Mexico and Texas as part of what was known as the Mexican Border Crisis (or the Mexican Border War). Newell served along the Mexican border in the U.S. Army Medical Corps with the rank of Captain. After returning from the Mexican border in 1917, Newell was promoted to Major, and appointed by the Governor of North Carolina as Chief Surgeon of the State of North Carolina. When the United States entered World War I in April 1917, Dr. Hodge Newell was serving in the 3rd Infantry, North Carolina National Guard based in Henderson, North Carolina. On August 5, 1917, he was drafted into federal military service in the U.S. Army’s Medical Corps, and sent for training to Camp Sevier in South Carolina. Assigned as a Major to the 105th Sanitary Train, 30th Division, U.S. Army, he then served overseas in Europe from May 8, 1918, through April 2, 1919, and was honorably discharged from active service on April 12, 1919. Newell was involved in the Aisne-Marne and Champagne campaigns. Upon returning to the United States from the war, Hodge Newell moved to the city of Henderson in Vance County, North Carolina in 1919, where he practiced medicine as an eye, ear, nose, and throat specialist. He was the initiating force in the construction and later expansion of the Maria Parham Hospital in Henderson and served for 25 years as medical director and manager of the hospital, until he was called into service in World War II. Newell served for 25 years as chairman of the Henderson (N.C.) School Board. He was a charter member of the Henderson Rotary Club, and held numerous officers in the American Legion. On June 25, 1925, Newell was promoted to the rank of Colonel in the North Carolina Army National Guard’s Medical Corps. At that time, he was assigned the command of the 105th Medical Regiment, 30th Division, U.S. Army Reserves, at their headquarters in Henderson, North Carolina. During World War II, Hodge Newell was called into active service as commander of the 105th Medical Regiment, 30th Division, while they were stationed at Fort Jackson, South Carolina. In the early days of the war, the U.S. War Department had not planned for sufficient installations and sanitary facilities at Fort Jackson. 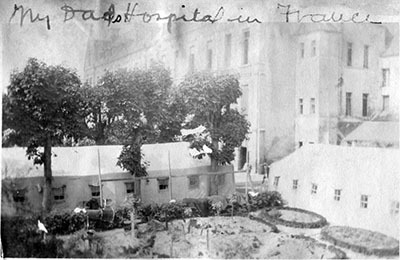 Reportedly, it was largely due to the pressure on soldiers by Col. Hodge Newell and his staff regarding the observation of proper military sanitation practices, that health conditions at the camp remained at a good level despite the poor facilities. Later, Newell was assigned to be the post surgeon at Fort McPherson in Georgia. He retired from the U.S. Army at the end of World War II in 1945 with the rank of Colonel. Dr. Hodge Newell was a member of the North Carolina Medical Society for over 50 years. He was a member of the Southern Medical Society, and the American Medical Society. And he also served as the surgeon for the Seaboard Air Line Railroad. Dr. Hodge A. Newell died on November 2, 1956, in Raleigh, North Carolina, and was buried in Oakwood Cemetery in Louisburg, North Carolina. “Henderson Doctor Dies,” obituary for Hodge A. Newell, Raleigh News & Observer, November 3, 1956. North Carolina Society of the Sons of the American Revolution Application for Membership for Colonel Hodge Albert Newell, March 4, 1930. Henry Dozier Russell, The Purge of the Thirtieth Division, edited by Lawrence M. Kaplan, Naval Institute Press, 2014, pp. 19. Finding aid for Hodge A. Newell Collection, WWI 65, WWI Papers, Military Collection, State Archives of North Carolina, Raleigh, N.C.
[Dr. Hodge A. Newell in his U.S. Army uniform, believed to have been taken while he was stationed in France during World War I.] Photograph. Hodge A. Newell Collection, WWI 65, WWI Papers, Military Collection, State Archives of North Carolina, Raleigh, N.C.
[U.S. military hospital in France during World War I where Dr. Hodge A. Newell as a Major in the 105th Sanitary Train, 30th Division, U.S. Army.] Photograph. Hodge A. Newell Collection, WWI 65, WWI Papers, Military Collection, State Archives of North Carolina, Raleigh, N.C.
25 January 2017 | Peek, Matthew M.